Welcome to 7 Weatherup Crescent, located on a quiet street with great access to public transit routes, parks and local amenities. This detached 2-storey home oozes charm, beginning with it’s private front porch, perfect for savouring your morning cup of coffee. Inside, the soothing colour palette greets you, welcoming you home after a day of work. Kick off your shoes and relax in the cozy living room, featuring a wood burning fireplace, perfect for cool spring evenings. A large opening leading to the dining room provides an open-concept feel and lets in plenty of light in from the large sliding glass door. When you are ready to connect with family over dinner, a well appointed kitchen offers views of the yard and a user-friendly work space with plenty of counter space. The stairwell and upstairs landing are filled with natural light drawing you upward to three family-sized bedrooms, with ample closet space. Separating the master bedroom from the other bedrooms is a modern 4-piece bathroom perfect for the family. A fully finished basement provides the ideal space for a child’s playroom, or a private space for guests, with a bonus powder room. Laundry and a utility room with added storage are both neatly tucked away on this level. The backyard is a hidden gem in this home, at nearly 130 ft deep, it is made for entertaining and family fun! 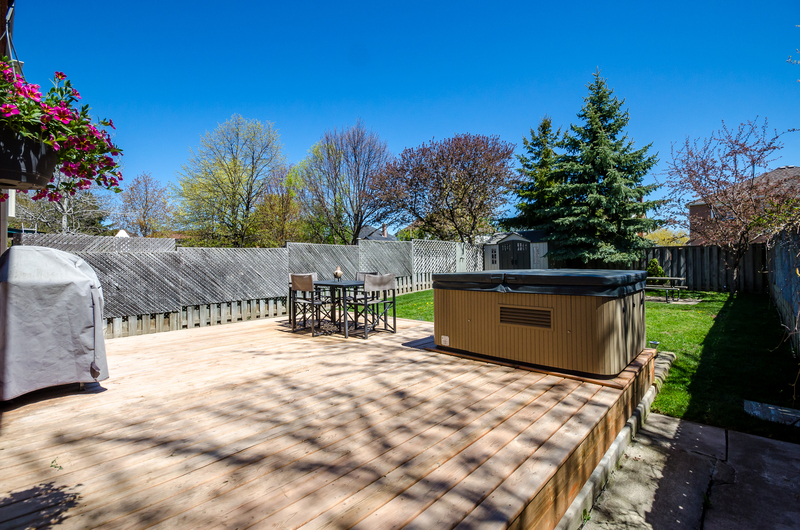 A large grassy area provides plenty of space for the kids to play soccer or tag, while the large 16 x 20 ft deck provides a relaxing vantage points for the adults. After the kids are in bed, a hot tub is the perfect spot to melt the day away in your private yard, followed by a quick rinse off in the outdoor shower. Start planning your summer fun at 7 Weatherup Crescent!